You may not give him a second look if he passed by you on the street. 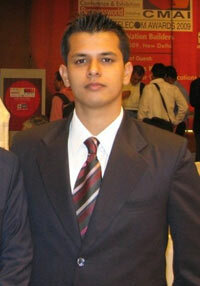 But 23-year-old Anubhav Srivastava has become something of an internet celebrity. He has over 18,000 followers on Twitter who are quite kicked about his documentary film Carve Your Destiny. In the documentary, Anubhav has interviewed some of the most successful people in India including Sheila Dixit, Shiv Khera, Kiran Mazumdar Shaw among others. The film is quite a hit online and Anubhav now wants to go global. His next aim, he tells us, is to approach international achievers. The idea of Carve Your Destiny was to gain insight into what it takes to be an achiever. So you have some of the most prominent personalities in India sharing their insights into life and their philosophies that made them who they are. Many of us go through life trying to figure out ways to be successful and are met with vague and pessimistic answers. I believe it gets easier when you listen to successful people and emulate what they've done. The idea for the film came about in mid-2007 during an international inter-university competition. I thought this might be a revolutionary concept and with support from an institution, it might just create a major impact. The idea was rejected and termed 'infeasible' because many felt that a student with no contacts couldn't make something like this happen. I was 21 then and determined to make this film... and I did. How did you choose your subjects? The intention was to get as many people from as varied fields as possible to talk about their life's philosophy. They also had to be known faces because otherwise not many would bother listening to them. Eventually I also decided to stick to people who are achievers in fields independent of the self-help/personal development industry. So with the exception of Shiv Khera, who has become somewhat of an icon in the country, no one is from the personal development field. What are the challenges you faced while making this documentary? The hurdles are far from over actually. Of course I faced many failures and disappointments before I got my first interview. Kiran Bedi was the first person who agreed to be interviewed. Between January and May 2008, I couldn't get anyone on camera. Kiran Mazumdar Shaw's office rejected my request over 25 times before giving me an appointment. With little or no contacts in the media, I relied on the internet to make contact. I also tried reaching out to them through their media managers, who would ask me if I belonged to a media house. There were times when I would be kept waiting for months before being turned down or would be told on the very day that the appointment was rescheduled to a later date... and then never respond to my calls! However the one incident that really got me upset was when I was told that the person I wanted to interview was not in the country and would not be available for two weeks. The very next day the same person was on a news channel in India. I must have been rejected at least a hundred times. But the only thing that has kept me going through this whole thing was the determination to fulfil an extraordinary dream. How many achievers have you interviewed so far? I have interviewed 10 well-known achievers from India for this film so far. They include IPS officer, social activist and recipient of the Magsaysay Award, Dr Kiran Bedi, Olympic medal winning wrestler Sushil Kumar, Padma Bhushan awardee Kiran Mazumdar Shaw, chief minister of Delhi Sheila Dixit, chairman of Moser Baer Deepak Puri, eminent television presenter Vinod Dua, acclaimed Indian painter Jatin Das, president of NASSCOM Som Mittal, author and motivator Shiv Khera and Miss India Universe 2009 Ekta Chowdhary. I hope to take the film international and interview well-known personalities overseas too. By involving famous international personalities, the film has the potential to attain mainstream global appeal become extremely commercially successful in the global market. Could you recount an incident from the life of one personality that touched you the most? Kiran Mazumdar Shaw's story was very interesting. It was 1978 and not many banks were taken in by the idea of a 25-year-old girl approaching them to set up a biotechnology company. It also didn't help that not many knew what biotech was to begin with. Most banks rejected her proposal till one bank decided to stand by her. Later, when the firm was established and ran into labour crisis, she defaulted on one of her loans. The bank immediately put up the company's name in the newspaper as a defaulter whose assets were for sale. As a response, she barged into the bank's chairman's office and made him take the company's name off the list. During the interview, Dr Shaw told me that the chairman of the bank still remembered her as the person who had the courage to come up to him and do whatever it took to take the company off the list while other defaulters just gave up and went out of business. I believe one is successful when they have attained whatever they wanted out life, are absolutely content with it and wish for no more. However, if they are jealous if others rise beyond their level, they are not truly successful, rather they are complacent and use the term contentment to hide their failure. Subjectively speaking, I believe the only life worth living is the one that is can be remembered even after it ends. I wish my life to be one that contributes something significant to the world. That is success for me. I am 23 and hold a degree in Finance. The film has opened new avenues for me. I plan to do my Masters in Mass Communications at the University of Leicester, UK. The film project will continue, only this time I plan to rope in international personalities. I am also looking for potential investors for the film. I want this film to create a revolution and I am confident that it eventually will.